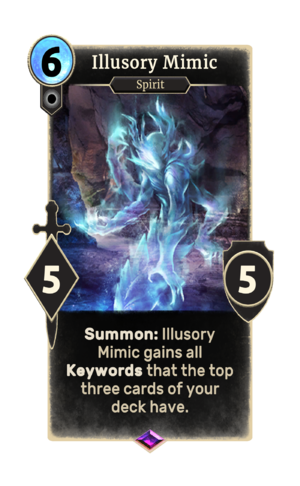 Summon: Illusory Mimic gains all Keywords that the top three cards of your deck have. Illusory Mimic is an epic Neutral creature card. It is part of the Madhouse Collection. It is available in the promotional Madhouse Collection pack during the Chaos Arena event. This card's summon ability applies the Imaginary Impersonation card effect. The card's art depicts a ghostly Harvester.